What is the Trunk of Tolerance project? The Trunk of Tolerance project is a program that offers interested teachers the opportunity to borrow free materials on teaching the Holocaust from the Jewish Federation of Greater New Bedford. The purpose is to teach tolerance and promote respect while helping teachers to supplement their existing curriculum and fulfill Common Core standards. The scope of this project is limited to stories of survival, rescuers, and resistance. How can the trunk materials be used in a classroom? Students can work in small groups to read the nonfiction books, discuss their point of view, and compare and contrast the stories. In small groups, students can discuss the posters, analyzing their content, historical context and relate Anne Frank’s message to today. Students can read the passports and discuss what they can infer about the lives of these people before, during, and after the war. Students can listen to testimonies from real people and discuss how propaganda played a role in changing the hearts and actions of law-abiding citizens, neighbors, and friends. 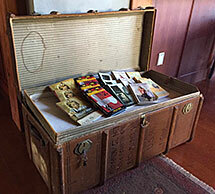 Students who have completed their regular assignments can use the materials inside the trunk to expand their knowledge and understanding of this period of history. What is the cost of borrowing a trunk? There is no cost to borrow the trunk. We appreciate your participation and know you will assume responsibility and take reasonable care of the trunk and its contents. Who is eligible to borrow a trunk? Public, private, parochial, or charter Middle schools in New Bedford, Dartmouth, Fall River, Fairhaven, and Mattapoisett may borrow a trunk. Teachers must have the permission of their administrators to participate. How does a teacher apply to borrow a trunk? A teacher should go to the Jewish Federation’s local website: jewishnewbedford.org and under the photo of the trunk click on REQUEST TO BORROW A TRUNK FORM, which can be completed and submitted online. The teacher will look for available dates on the live Google Calendar and select ones that fit his/her schedule. Within several days the teacher will receive a confirmation email. Where does a teacher pick up a trunk? How long may a teacher keep the trunk in his/her classroom? What should a teacher do when he/she is done with the trunk? (508) 997-7471 to coordinate drop-off. When you return the trunk, please share with us any completed student projects, which will be saved for an exhibit of student work in the spring. What are some suggestions for student projects? Our committee would like to include student projects at our annual exhibit in the spring marking Yom HaShoah, the Day of Remembrance of the Holocaust. These projects would reflect the student’s understanding of the Holocaust as a lesson for today’s world. Does the Trunk of Tolerance project require teachers to complete an evaluation form? Feedback is key to improving our project. The short evaluation form online will help us refine our efforts to enhance the teacher’s Holocaust lessons. How does a teacher complete an evaluation form? EVALUATION FORM, which can be completed and submitted online. How did this Trunk of Tolerance project start? With the overwhelming violence in the news, our interfaith committee wanted to take concrete action to discourage hatred and bigotry in our community. We learned that Trunk Projects have been in existence for years in many states across the U.S., including Georgia, Florida, New Jersey, Texas and Washington State. Holocaust museums and state commissions on Holocaust education often sponsor them. Private, public, nonprofit and corporate sectors often donate money to support these projects. We followed many of their guidelines, which included letters requesting permission of administrators, parents, and teachers. Who does a teacher contact with specific questions, comments or to request a speaker to come to his classroom? How can I support the Trunk of Tolerance project? The materials in each trunk cost approximately $400. Your donations help us to create more trunks and serve more students. On the Jewish Federation website, use any PayPal donation button and specify Trunk of Tolerance as your preferred contribution. Thanks for your support for this worthwhile project!